"La Vela Istmeña" is an annual festival held in Xalapa by the Fraternidad Istemña Oaxaquena. This club comprises members who were born in or who have ties to the nine areas that make up the isthmus region in Oaxaca state (in south-eastern Mexico). 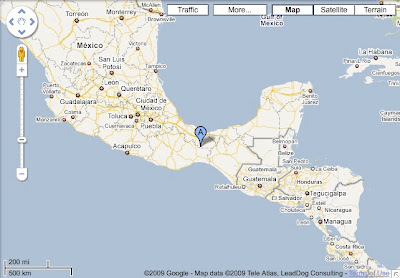 Xalapa, where this event took place, is due east of Mexico City, almost on the east coast. The festival celebrates the patron saints of Oaxaca, and includes a lavish meal of regional dishes, traditional music and dancing. 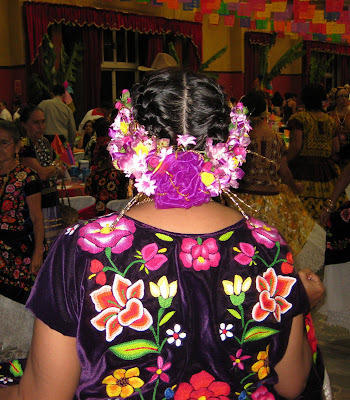 The majority of attendees also dress in traditional clothing, with the women stealing the evening in their gorgeously embroidered dresses, heavy gold jewellery (silver is much more typical of Mexico), elaborate coiffures and passion for dancing. The fraternity was established in 1992 with the express aim of preserving and promoting folkloric traditions from the region. This year I was lucky enough to be in Coatepec at the time and was able to go along (my ticket was very last-minute and I only managed to secure one because at the very moment my friend called to inquire, someone had just returned a ticket because they weren't able to go themselves! Tickets sold out very quickly for this event). The evening opened with the crowning of this year's queen, Sthpanny de Jesús Frayle Suárez. The opening ceremonies for the evening included Sthpanny dancing with a key member of the Fraternity in a stylised, traditional manner that was mesmerising to watch. While we were eating, members of the Fraternity moved through the room, tossing out all manner of items to the crowd. My excellent friend, doña Angelita Guzman de Rivera explained to me that this was a custom imported directly from Oaxaca and is still very much a part of Oaxacan festivities. Items ranged from coloured palm-front fans, woven baskets, red neckerchiefs for the men, to large bowls and spoons for the kitchen. The dancing all night was wondrous to behold! What I especially liked about it was the freedom to dance with whomever—women danced with women, or on their own, or with men. The turning dresses were a living kaleidoscope. There were two bands on stage, and they alternated sets. One band--the one you can see and hear in this video was a more contemporary danzon-style 4-member band, while the other had a cast of thousands--playing trumpets, guitars, percussion, etc.--and played more traditional dance music. The main ceremony involved a number of processions through and around the room, and the ritual lighting of large candles in honour of San Vicente Ferrer, patron saint of celebrations and fiestas and la Virgin de la Soledad (the Virgin of Solitude), patron saint of Oaxaca city (what a fascinating pairing!). Then we continued eating, dancing and laughing into the wee hours of the morning. (Even the taxi ride home for us--six women in one tiny car, all wearing traditional dresses--was hilarious! The policeman at the checkpoint outside Xalapa just shook his head, laughed and waved us through). The president of the Fraternity and his wife. This gives a very small sense of how the hall looked. Colour and movement everywhere all night! Angel and friend. One of the things I especially loved about the evening was how everyone of all ages was there! The dresses were such a feast for the eyes! My dear friend, doña Angelita, looking fly in all her finery! The main ceremony of the evening comprised lighting large candles to celebrate the patron saints of Oaxaca. This included a number of processions involving mostly women. These are the candles (las velas) that were lit in the main ceremony for the evening. Me, in all my finery, with good friend Cesar Guzman on the right, and the treasurer of the Fraternity on the left of the photo. Cesar owns "El Tigre" in Coatepec, a leather goods workshop that's been in the family for over 60 years. Just one example among hundreds of women's hair adornment. The movement of the embroidered dresses was fascinating to watch as the women danced. For more videos of the night, go here. Niagara Falls never ceases to amaze and awe us. Driving back from Toronto to New Jersey late in February this year, we stopped to have a look at the Falls, not thinking that we'd find them quite different in the winter cold. And cold it was! Cold, cold, cold! But, oh! How incredibly beautiful everything was. The spray from the Falls themselves froze as it settled on the trees, rocks and railings, and made everything glitter, sparkle and shimmer. The Falls themselves were their usual impressive selves--reminding everyone of how puny humans really are. About a week or so after our visit, a bloke threw himself over the Falls ... and survived! Inconceivably true.